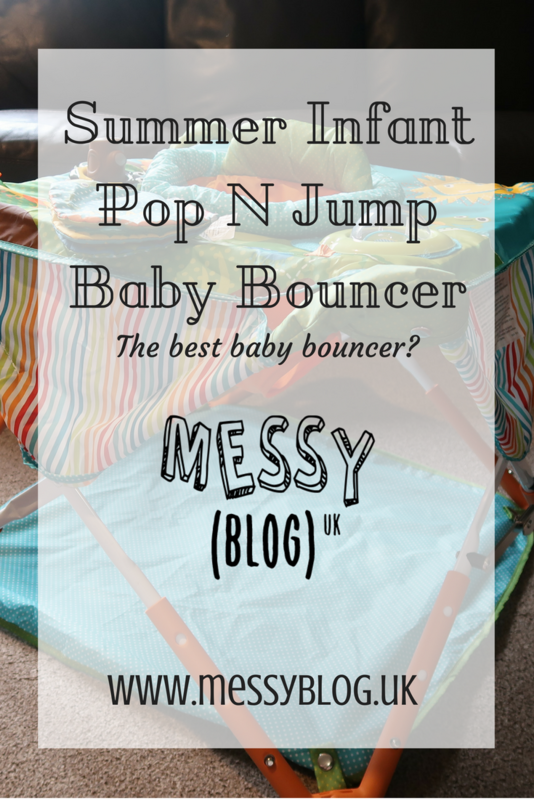 The Pop N Jump is a similar product to other popular bouncers but is smaller, softer and portable. It looked perfect for our small house so I added it to our Christmas shopping list. Then, in spectacular timing, I was asked if I’d like to review one… Well yes, of course, I said – and it arrived a few days later. Upon opening the box, I was very impressed with how effortless it was to set up. There was no assembly required and it was folded up inside its handy carry bag. All I had to do was take it out of the bag and open it and then apply the two safety catches at the side. 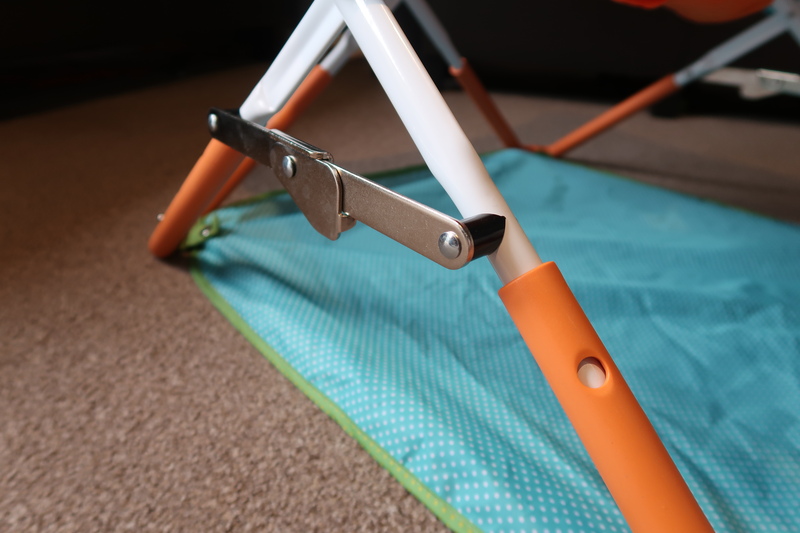 The Pop n Jump is lightweight and comes with a sun canopy that can be added for use outside and has a groundsheet attached to protect little toes from cold floors or rough ground. On the top part, there are is a hole for the seat and in front of that are a couple of toys. 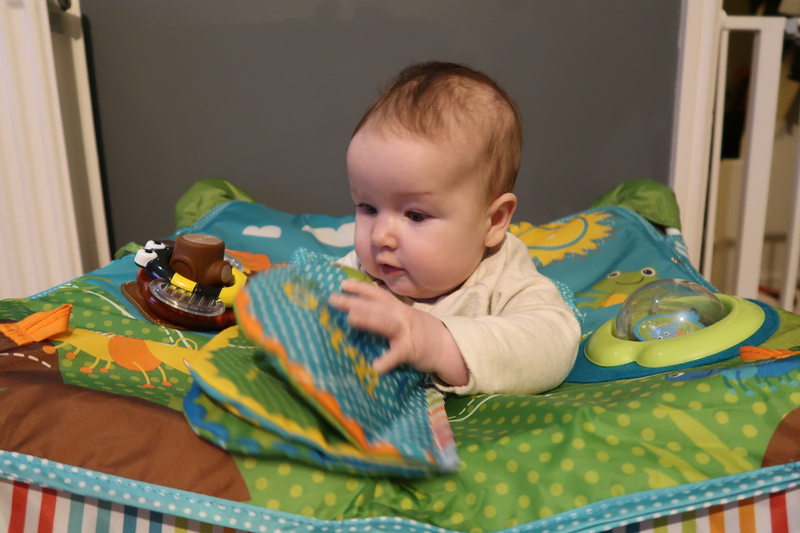 One is a spinning ball, one is a book which is held in by a velcro loop, making it easily detachable and one is a rubber tree stump which holds a red apple-shaped rattle and a bumblebee teether. The design is cute. It features a picture of a meadow with some sky and a friendly looking owl, sun and frog. The metal frame is covered with bright coloured fabric and the leg heights are adjustable meaning it can grow with your child. 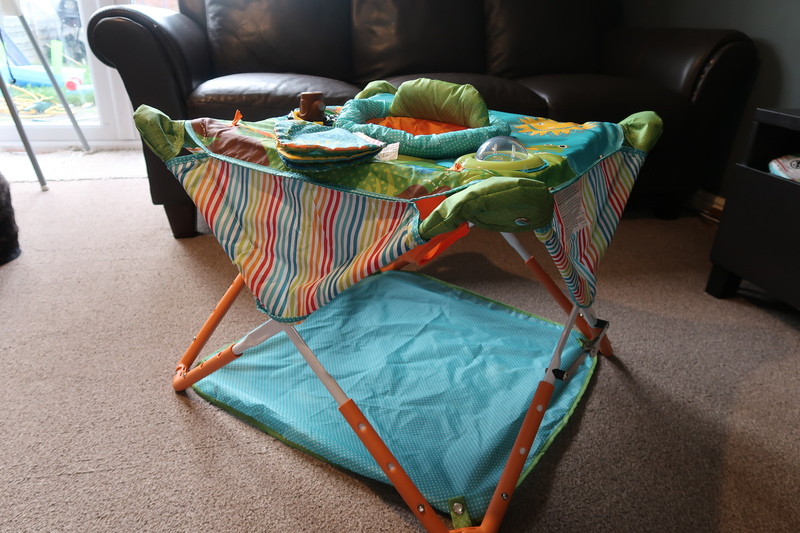 I was happy to see a fairly wide seat base to give both comfort and support to baby. The box says it’s suitable from 6 months. 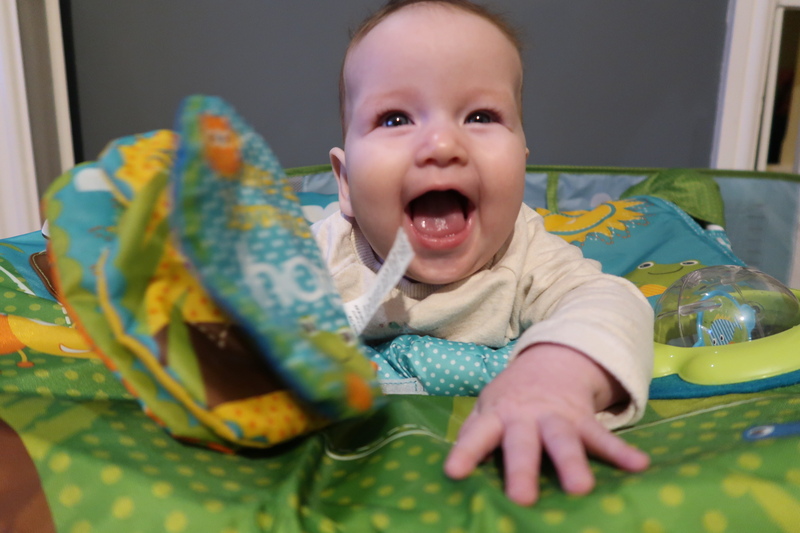 Bridget has just turned 5 months and is quite happy in there but I will be putting it away for Father Christmas to bring back next month when she actually is 6 months old. I think my favourite feature is the fact that is portable. I often spend the day visiting family and sometimes babies just don’t wanna be held for that long. Being able to take this with us means that Bridget can be part of the action and play in amongst her siblings and cousins. She can take in what’s going on around her wherever we go but also, I have my hands free too! It may not have as many functions as other bouncers in the market but the fact that it doesn’t sing and light up is a bonus for me. It’s much simpler. Babies don’t need ‘all singing, all dancing, super hi-tech-hifi-wifi gadgets’. The rustling noise that the book makes, more than entertains Bridget at the moment. She also finds it super tasty! She loves the spinny ball too. I find I can put her in there for about 20 mins to half an hour at a time at the moment. Which is long enough for me to wash up and of course I can take it in the kitchen so she’s still with me. As she grows, I’m sure she will be happier for longer. Although we were sent this product to review, I had planned on buying it and I think I would be very happy with the money spent on it. It’s light, folds up so doesn’t take much space and doesn’t have any irritating tunes. Bridget loves it and it will last her a good 6 months or so. Even Liam, my mum and my sister like it so it’s a definite thumbs up from us. Just wondering how the canopy folds up and stores? I just purchased this jump n play for the outdoors and for he life of me cannot get the canopy to fit in the carry bag! Any pointers ? !